There's a framed print-out on the wall at Red 5 Studios— a magazine clipping from a late-2011 PC Gamer article entitled "50 Reasons Firefall Will Rule 2012." It's a perfect indicator of the long and presumably arduous road that Firefall—Red 5's first project—has traveled to completion. 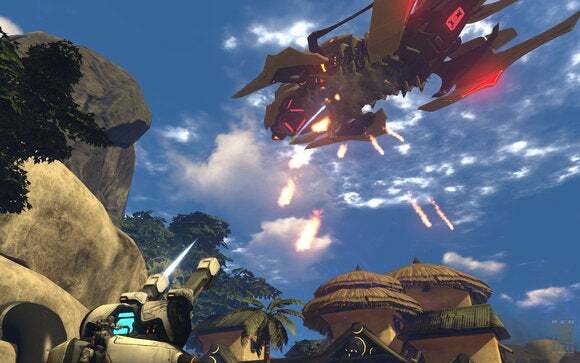 The road ends July 29, when Firefall will actually release to the public, four full years after its reveal, and two years after it was supposed to "rule." When I talk to the devs, most of them are very frank. "This is the longest I've worked on a title without shipping something," is a common refrain. What's incredible about Firefall, though, is the game still seems good, despite its meandering development path. That's more than you can say about most games that fall into development hell. In my notes I'd written "Looks and feels a bit like Borderlands." I ask about the comparison. 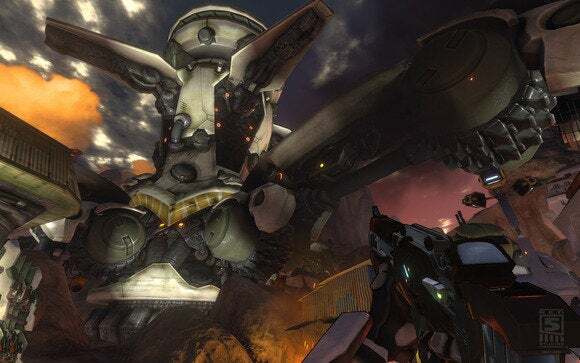 "At one point it felt even more like Borderlands," I'm told by one Red 5 developer—there were thick black outlines around everything. Now only a slightly cel-shaded art style remains to attest to that phase of the project. 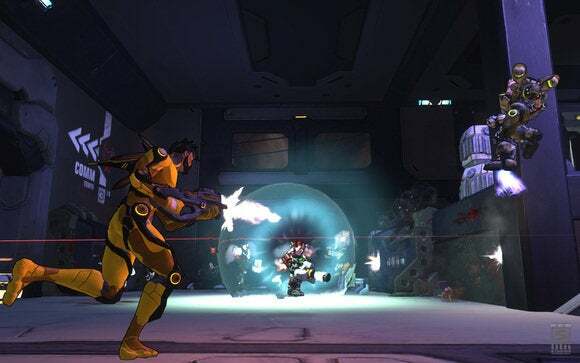 It makes sense—Borderlands and its loot-driven experience adapted MMORPG systems to fit a first-person shooter, and Firefall is bringing things full-circle to create an MMOFPS. Or an MMOTPS, if you want to play it as a third-person shooter (you can swap between the two views by clicking the middle mouse button). You've got your tiered loot system, with items color-coded by rarity. You pick up jobs from a job board. You go out into the environment and fight computer-controlled enemies to find new loot and level up your "Battleframe"—an armored exoskeleton that serves as your health, shield, and character class simultaneously. You can swap out your battleframe at any time, effectively changing classes without creating a new character. Each battleframe levels up independently, though, so be prepared to start from square one when you do. It's all pretty standard for a massively-multiplayer online game, except Firefall is a shooter instead of another in a series of increasingly-tedious "turn-based RPGs disguised as pseudo-action games" emulating the juggernaut World of Warcraft. Is that enough to draw in people who don't typically play MMOs? I don't know. It certainly feels different. World traversal handles like a big-budget shooter, albeit with a focus on making movement engaging—not a surprise, considering the game has some DNA from the high-flying Tribes games. Each character has jump jets that allow brief flight, plus an array of vehicular options that range from motorcycles to hang gliders. Improved movement directly improves combat. We seem to be in a movement Renaissance for shooters, what with Titanfall and Call of Duty: Advanced Warfare and now Firefall eschewing realism and resurrecting the complex movement systems used by twitch shooters in the 1990s (Quake, Unreal Tournament, et cetera). Developers are finally taking advantage of the Z-axis after years of neglect, and it makes for a higher skill-ceiling and more interesting tactical options. It also opens up the world immensely, allowing for more verticality in level design but also making it fun to explore the environment. I spent most of my time with the game just jumping up cliffs and trying to reach areas that seemed inaccessible. Instead of finding empty vistas awaiting me, Firefall does a good job of filling in content wherever it makes sense. 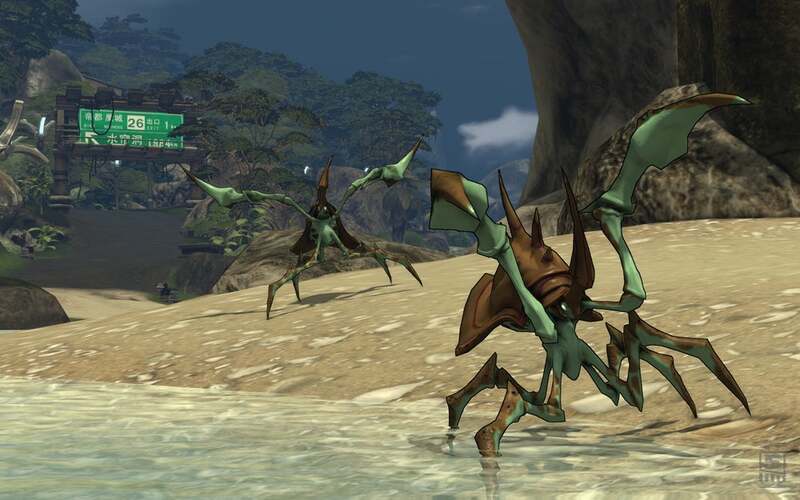 The game uses a dynamic spawn system to randomly generate points of interest for players to explore—maybe a side battle or a mini-boss or something of that sort. Even some of the actual missions are randomized in terms of locations, allowing players to re-run content without literally running the same parts of the map repeatedly. There's also a separate player versus player zone called Broken Peninsula that's opt-in—if you don't ever want to fight another player, you don't have to. We didn't demo this PvP zone personally, though it sounds like it works similarly to fellow MMO shooter Planetside 2—there's a persistent online world in constant flux, and it's up to you and your teammates to capture and hold bases. I still have some questions that can't be answered until release day, primarily concerning performance. Latency is the death of a shooter. While Red 5 claims it models shots "in the past," thus ensuring that you hit whatever you aimed at by compensating for the latency, I wonder how it will work when there are hundreds of people running around on a server. That's something we can't know from a small playtest at the studio, and always a concern with an MMO. The shooting itself is also lacking oomph. While the game has a lot of guns, it could do with making those guns feel different/important, especially when it comes to legendary weapons. Every gun within a given group plays similarly, and it makes the loot progression feel less interesting than it should. 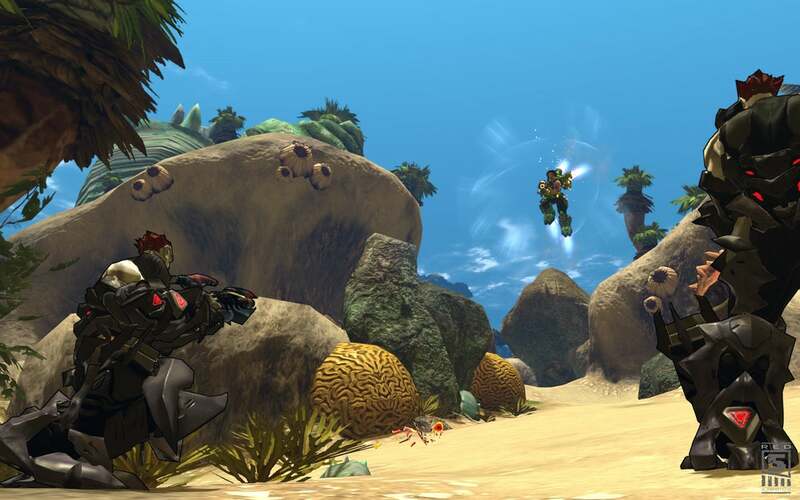 But all in all, it's enough to make me take a second look at Firefall on release. I'm not big on MMOs, but Firefall feels less like what I associate with the MMO label and more like an expansive shooter. And hey, it's free. Red 5 only plans to sell cosmetic items and other superfluous things—at one point my character had a snowman head—and even those are purchasable with in-game currency if you put in the time. I've got some quibbles with the story, since at the moment it sounds like generic science fiction schlock (a catastrophic event destroyed the planet and then humanity came under attack by beings from another dimension) but overall Firefall seems like it will probably be worth the (nonexistent) price of admission come July 29.